In my continued desire to make pie/tart-related products, I decided I would endeavour to make a baked pie (as my previous pursuits have been no-bake tarts). Traditional pie dough is also slightly different than what I had been making previously, but I was determined to try my hand at genuine pie. I had discovered a stash of frozen blueberries in my mother’s freezer and decided they would make the perfect candidate for my pie filling. The Bon Appétit Desserts book had a happy selection of pie options for me to choose from, so I went with the somewhat ambitious lattice-top blueberry pie, from which many shenanigans ensued. Combine blueberries, sugar, cornstarch, lemon juice and peel in heavy large saucepan. Cook over medium heat until mixture thickens and bubbles, stirring occasionally, about 15 minutes. Continue to cook 1 minute longer, stirring constantly. Cool until warm. Preheat oven to 400 F. Roll out 1 pie dough ball on lightly floured surface to 12″ round. Transfer to 9″ glass pie plate and trim overhang to 1″. Spoon filling into the crust. Roll out remaining dough to 13″x10″ rectangle. Cut into 3/4″-wide strips. Arrange half of dough strips atop filling, spacing evenly. Arrange remaining dough strips at right angle atop first strips, weaving if desired, to form lattice. Brush crust edge with cream and press strips to adhere. Fold edge of crust up over strips, pressing gently to seal. Brush lattice edges lightly with cream. Place pie on baking sheet. Bake until crust is golden, about 1 hour. Cool pie on rack at least 1 hour. Stir together flour and salt in a large bowl. Cut in cold butter pats with a pastry blender until the mixture resembles coarse meal. Mix in ice water until moist clumps form. Gather dough into 2 balls and refrigerate for at least 30 minutes. A few notes on preparation: Now I realize that pie dough can be a bit finicky at times, but the pie gods seemed hell-bent on de-railing me from my attempts to make pie because I had nothing but grief in making my pie dough. I originally tried the Bon Appétit Desserts recipe for “Best-Ever Pie Crust” which involved 1/2 cup of butter and 1/2 cup of shortening. But it was incredibly greasy, maybe because the shortening was not chilled enough (? )–in any case, despite practically freezing the dough, it was nigh on impossible to roll out. So, I called my mother. I tried her recipe and it seemed to do better. However, for whatever brain failure on my part, I first believed that I needed to blind bake the pie crust before putting in the filling. When I popped it in the oven for about a minute, it started to sag in on itself, much like my brain that was slowly imploding with the realization that my dough would never work out. I realize now that if I actually did need to blind bake the crust, I should put down foil with beans or rice in the middle to hold the pie dough up. Nonetheless, I was so annoyed with my self that I rather angrily made my lattice strips (thus completely abandoning any measurement or semblance of care/sanity). 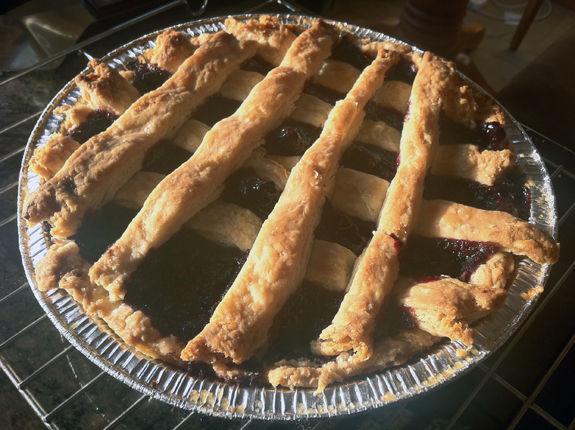 I filled up the saggy pie crust with the blueberry filling and laid down my unattractive lattice strips. Now there is something to be said for low expectations. I assumed that this pie was doomed. However, it was actually really delicious! The lattice top was golden and flaky, and the filling was set just right (not too runny) and not too sweet. The recipe noted that the blueberries are cooked separately to ensure that the filling has the perfect consistency, and I believe it really did help. I should try it on other fruit pie recipes. I was so glad that despite the pie being rather feeble-looking, that it all worked out in the end. Otherwise, this would’ve made for a more depressing post.